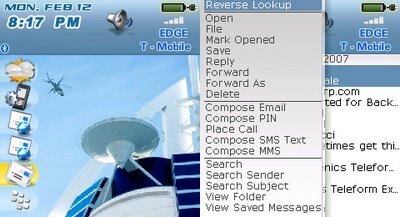 Free Blackberry 8800 Theme | BlackBerry Blast! With all the buzz around the new Blackberry 8800 many other Blackberry users are probably feeling left out. Well if Kradest has their way Pearl users will be styling with a new Blacbkerry 8800 theme. That's right, you can now get your hands on a free BB 8800 theme for the Pearl. We've told you about other themes that they've released over at Kradest, but this time it's a Blackberry 8800 theme entitled indigo. It looks pretty slick and you can get yours at the link below.